Cell Membrane: What does semi-permeable (selectively permeable) mean? 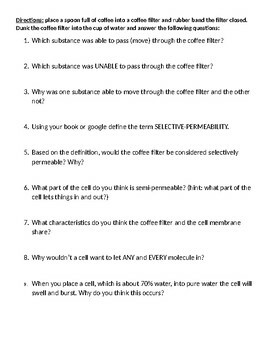 Easy, quick, hands on lab that uses coffee and coffee filters to show the meaning of what it means to be semi-permeable. Activity is complete with student instructions and reflection questions that tie the activity to the cell membrane, cell transport and homeostasis. I have personally used this lab for the past 5 years with my students and it works!